Trend Lab Deluxe Flannel Fitted Crib Sheets are cozy and stylish. 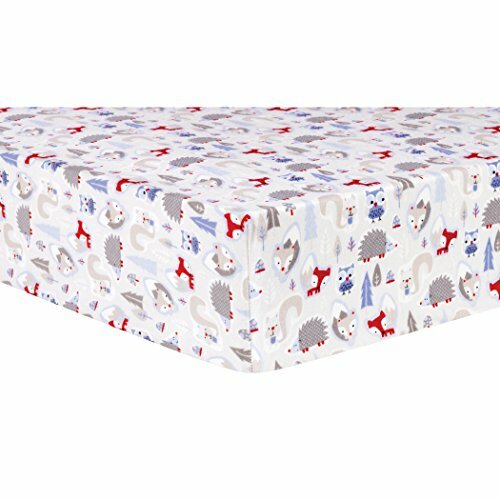 Our soft 100% cotton flannel Lilac Winter Forest crib sheet features cuddly forest animals with woodsy icons in beautiful glacier blue, dove gray, pomegranate red, periwinkle purple, Icelandic blue, and white. Our deluxe 10 inch deep pockets and full length elastic offers a more secure fit on standard 28 inch x 52 inch crib mattresses. Sheets are machine washable. Additional colors, prints and Deluxe Flannel products from Trend Lab are sold separately.